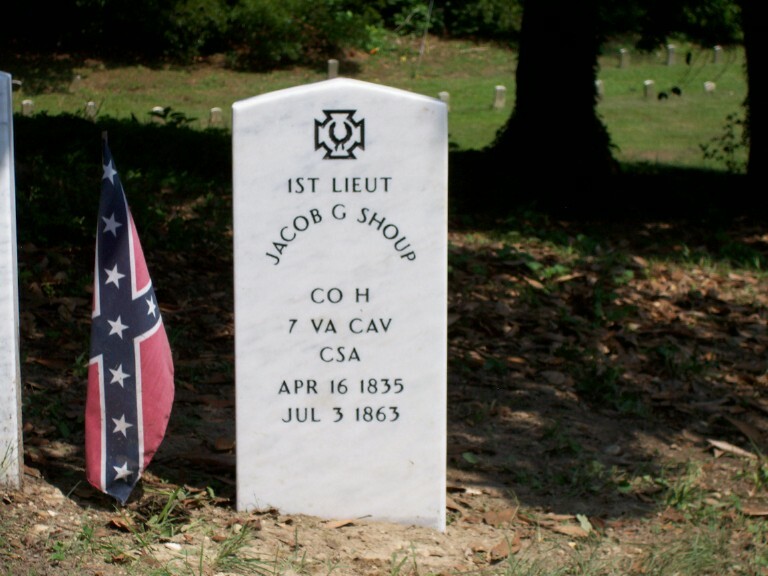 The picture in this article is of the tombstone at the “grave” of Jacob G. Shoup, located in Hollywood Cemetery in Richmond, Virginia. It is in the Confederate Section, near the base of the large Confederate rock pyramid dedicated to the Confederate soldiers who died at Gettysburg, and whose remains were brought back from their burial places in Pennsylvania to be reburied among their own in a mass grave, in the early 1870’s. The picture was taken in 2005 or 2006, by a worker at the cemetery. The marker was free and the cemetery orders it and sets it for $100, a price I split with another more direct descendant of Jacob. You see, Jacob is one of my Middletown letter writers, and I have discovered that his 2nd great grandmother, Dorcas Moore, was sister to my 7th great grandfather, Dr. James Moore. (I did not put the flag there, the cemetery did, but if I lived closer I would do so.) The tombstone does not sit on his grave, rather is placed with others of its kind in a row over the mass grave. Why did I help have it erected in his memory? Because I felt that he deserved no less. I know much more about his family history than I did when my mother found the letters in 1958. I know his brother, Cal, was Captain of Company H, and that he and Cal were both shot while leading a charge to rally their troops at the Battle of Fairfield, a smaller action on the third day at Gettysburg. I know he died instantly from a bullet to the head. Cal was severely wounded in the leg, survived the long trek back to the Valley with Lee’s caravan of wounded, healed, and lived to fight another day, only to be killed himself in action during The Burning of the Valley in Oct. of 1864. Their mother, Caroline, lost two sons to the war. North or South, that was a tragedy. One I can’t imagine. A long time ago, I made a promise to one of the letter writers, Caroline Lincoln, that I would do what I could to see that she and her letter, and those of the others I called the Middletown Letter Writers, would not be forgotten by future generations. This is the first of such attempts on my part.